- If Wikileaks and Julian Assange hadn't released the absolutely damning DNC and John Podesta emails, we might have a 'President Hillary Clinton' in America right now. In this extremely important story over at Zero Hedge that ANP reader 'I Don't Know' had linked to in this comment section yesterday, their story, a message to President Trump, began: "I write to you because I’m seeing something unfold that concerns you, and I have no way of knowing if you’re aware of it, nor have I seen anyone else mention it. That is, sir, you are being set up, a trap is being set for you, and unless you are aware of it, you may well walk into that trap eyes wide open." The story went on to detail for POTUS 'the trap' that is being set for him with Wikileaks' Julian Assange potentially prepared to be evicted from the Ecuadoran Embassy in the UK at any time (though Ecuador recently rejected that claim as was reported within this NBC story). The ZH story then warned POTUS: "What’s most important to your own situation, as well as that of Mr. Assange, is that the people who are after him are the very same people who have been after you for 3 years, and who will double their efforts after suffering a huge loss due to Robert Mueller’s No Collusion report." 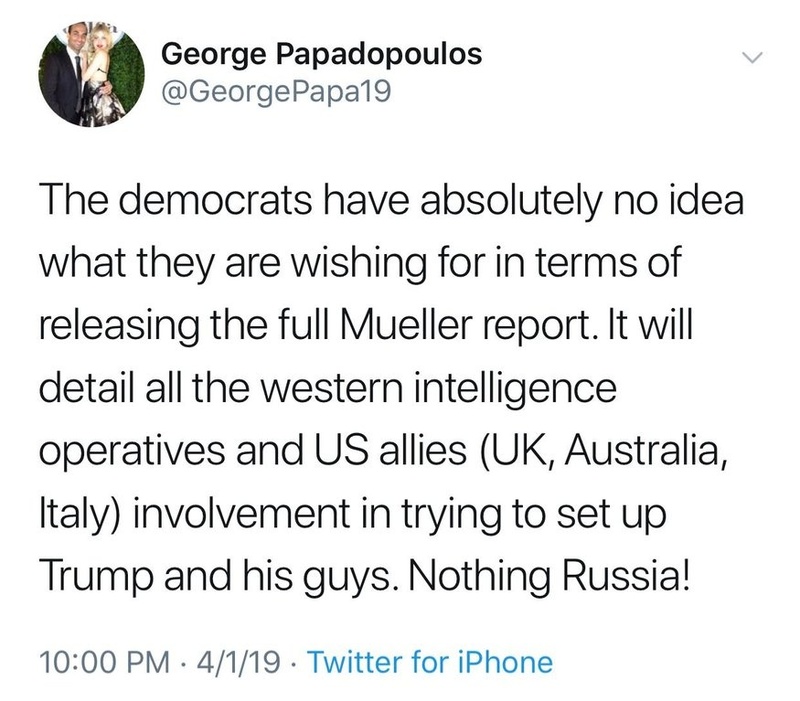 As William B. Stoecker reported on ANP on April 5th, with the 'deep state coup' attempt upon President Trump having failed and the full release of the Mueller report and FISA reports, potentially in the near future, sure to blow up in the Democrats faces, former Trump advisor George Papadopoulos recently tweeted "the Democrats have no idea what they're wishing for" of the release of the Mueller report. Stoecker's story had warned "it's false flag season in America" and as he reported within it, the corrupted faction of the deep state that sold out President Trump and America are sure to try to pull off an 'event' in an attempt to regain 'control' and 'the narrative' if they are not held accountable for their crimes of treason against America. But as we'll see in the story we'll be exploring in the next section below looking at this 'globalist trap' to set up President Trump, it likely stretches halfway around the world, all the way to the Ukraine. With the next Ukrainian election coming up in just over 2 weeks, that election pits globalist stooge Petro Poroshenko against a 'surreal political entity', a TV star/comedian, who is leading the polls and could sweep to a resounding victory there. Yet as the Russian government itself recently warned, the globalists may try to interfere in the Ukrainian election though the Washington Post reports it'll be the Russians interfering. Amid Special Counsel Robert Mueller’s probe into alleged Russian interference in the 2016 presidential election, a Ukrainian lawmaker is demanding Hillary Clinton be investigated for colluding with Ukraine in her plight to win the White House. On Wednesday John Solomon at The Hill interviewed Ukraine Prosecutor General Yurii Lutsenko. The Ukrainian prosecutor told Solomon that he found evidence of a top law enforcement official saying his agency leaked the Manafort financial records to help Clinton’s campaign. The Ukrainians were actively colluding with the Clinton Campaign in the 2016 US election and Lutsenko has proof. 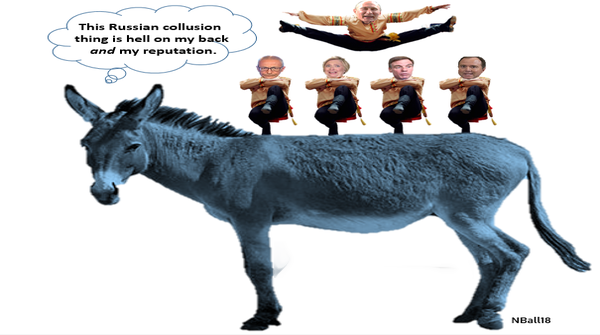 Dirty cop Robert Mueller knows about this collusion but refuses to act on this clear evidence of election crimes by the Clinton campaign. As we read in this April 3rd story over at RT and hear in the first video at the bottom of this story from videographer 'Russian Insight', NATO has allegedly issued an ultimatum to Russia, saying that US-led NATO ships will go into the Azov Sea, Russia's territorial waters, without Russian permission. Which the Russians warn may very well be in attempts to stoke 'an incident' at a time when the Ukrainian Presidential election is only weeks away and 'globalist puppet' Petro Poroshenko is on the ropes and appears to be on the way to being utterly humiliated by a man who has never held political office before. Enter Volodymyr Zelensky 'stage left', a 41-year-old comedian whose closest foray into politics has been playing a schoolteacher-turned-president on one of the Ukraine's most popular TV shows, "Servant of the People". In fact, Zelensky went ahead and founded a political party by the same name, and his "Servant of the People" party is now only one election away from taking power in the Ukraine. And while Zelensky is not 'pro-Russia' at all, he's much less 'anti-Russia' than Poroshenko and the globalists would like and at this very moment, he's currently leading in the polls to win as we hear in the 3rd video at the bottom of this story. As this entry at Wikipedia reports, Zelensky took 30.24% of the first round of the presidential voting, nearly doubling the 15.4% garnered by the very unpopular Poroshenko yet as we must remember, Poroshenko was basically 'installed' as Ukrainian president by Barack Obama and the globalists during the Ukrainian Revolution over pro-Russian former President Viktor Yanukovych who is now living in Russia in exile and wanted by the Ukraine for treason. 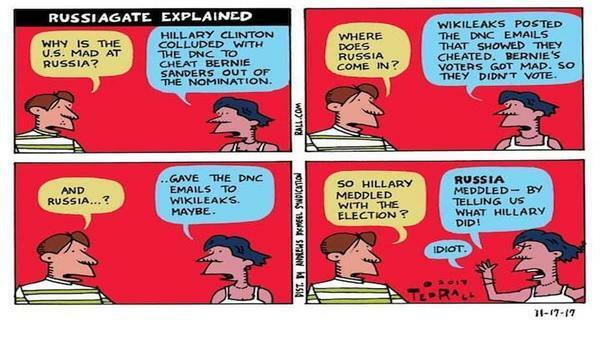 And while all of this is going on half-a-world away and is being totally missed by most Americans as the mainstream media pays little attention to events in the Ukraine until they fit their desired political narrative, as Global Research had reported back in 2015, all of the globalists moves being made in the Ukraine are part of their roadmap towards a 'new world order' they've long been on. And as the Global Research story warned, that means they're carrying out a very reckless romp towards World War 3. 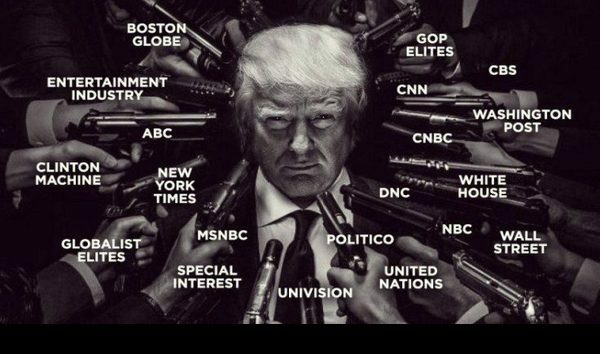 So once again, let's come back to this story over at Zero Hedge and their warning to President Trump that he is being set up in a trap that he may walk right into without even blinking if the globalists long seeking to take him down, those who have also been seeking to have Assange arrested for publishing evidence of their crimes at Wikileaks, have their way. In the 2nd video at the bottom of this story, videographer Martin Brodel takes a look at the Zero Hedge story and as one wise commenter on his video pointed out, "President Trump needs to realize who his friends are when it comes to Assange. Not that Assange is necessarily pro-Trump, but Wikileaks information was a strong influence to cause people to vote for Trump in 2016. If Trump lets Assange be thrown under the bus, he will not only do himself a disservice, but us as well." Step one: Murder Seth Rich. From the Zero Hedge story. With our eyes sure to be looking towards the Ukraine over the next few weeks as their presidential election approaches and Russia warns of potential 'dirty tricks' there, let's take a closing look at the man running against Petro Poroshenko and his pledge to rid the Ukraine of corruption via his TV show. According to Netflix's description of the show "Servant of the People", "After a Ukrainian high school teacher's tirade against government corruption goes viral on social media, he finds himself the country's new president". 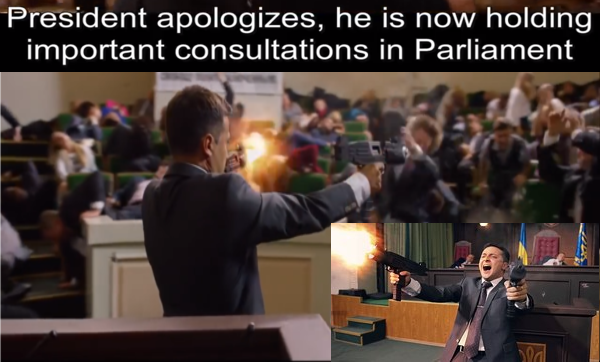 With life once again mimicking art as the character played by current Ukrainian presidential candidate Vladimir Zelensky is cast into the role of an anti-establishment President at a time of great corruption in the Ukraine, we found the scene above taken from the first season of the comedy show's trailer to be quite defining as 'President Vasiliy Petrovich Goloborodko of Ukraine' holds 'important consultations in Parliament' along with two of his favorite 'weapons of choice', mowing down corrupt members of the Ukrainian Parliament in a scene so surreal with Zelensky now potentially weeks away from the Presidency. So with the Ukraine potentially a kick off point to World War 3 as the Organic Prepper had reported in this February story while comedian Zelinsky has let it be known that he prefers an easing of the tensions between the Ukraine and Russia as part of his political platform over war with them, the globalists could lose another point of friction against Russia should Petro be knocked off by Zelinsky and he begins focusing upon cracking down upon widespread Ukrainian corruption instead of war with Russia as he has promised. So we pray for the safety of President Trump and hope that he treads carefully in the days ahead to avoid the traps the globalists are setting for him in the Ukraine and potentially with Julian Assange. For if Wikileaks and Assange hadn't released the absolutely damning DNC and John Podesta emails, we might have a 'President Hillary Clinton' in America right now.